This page is an (incomplete) list of the companies that profit from providing security guards and surveillance technologies, building walls and demolishing homes, manufacturing tear gas or stun grenades, supplying buses and planes to carry people to detention or deportation, and more. They are paid by the French or British governments, Eurotunnel or the Port of Calais, or other key decision-makers in the Calais border system. The Dunkirk-based company Eamus Cork Solutions was created in 2004 by a former Calais policeman. ECS was awarded a 3 year £7.1 million contract for port security in 2011, which was later extended for a further two years.1 The firm does a part of the work of the UK Border Force in “freight searching detention & escorting services at Dunkirk and Calais in the British Control Zones.”2 They also work with the port in Boulougne, according to their website.3 They work in connection with the dog-handling company Wagtail. They have sometimes been criticized in the media as incompetent because their workers apparently fell asleep on the job and allowed people to escape from detention centres.4 They have also gotten media attention for failing to pay their workers for overtime hours.5 The job ECS carry out has been massively expanded and put up for re-tender by the Home Office for £80 million. The winner of the new contract will be announced in December 2016. Tascor currently holds the contract for transporting and “escorting” detainees and running “short term holding facilities” throughout the whole UK. This includes working in Calais and Coquelles. Tascor’s UK-wide contract is due to expire and is currently being re-tendered by the Home Office.9 The Calais part of the job will in any case become part of the new £80 million contract for privatised border security which is also now out for tender. 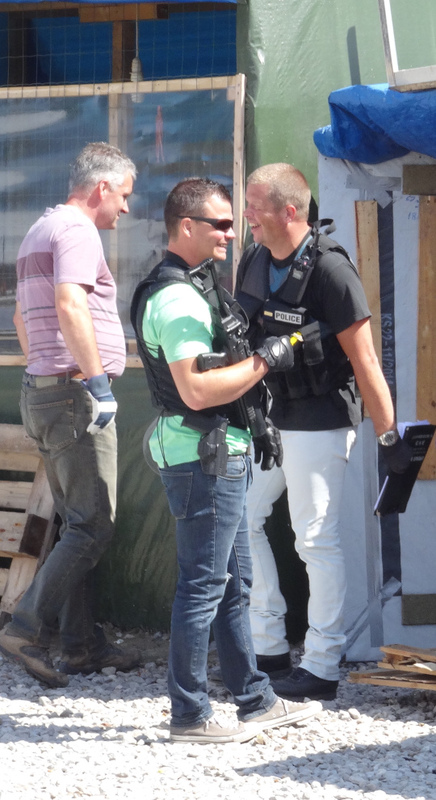 This company was reported to have provided security on the container camp construction site by Cette Semaine. This company often provides site security for Eiffage, Bouygues, etc. Vinci is a massive French and international construction and outsourcing company, best known in France for making mega-profits from government concessions to run over half of the country’s motorway system. 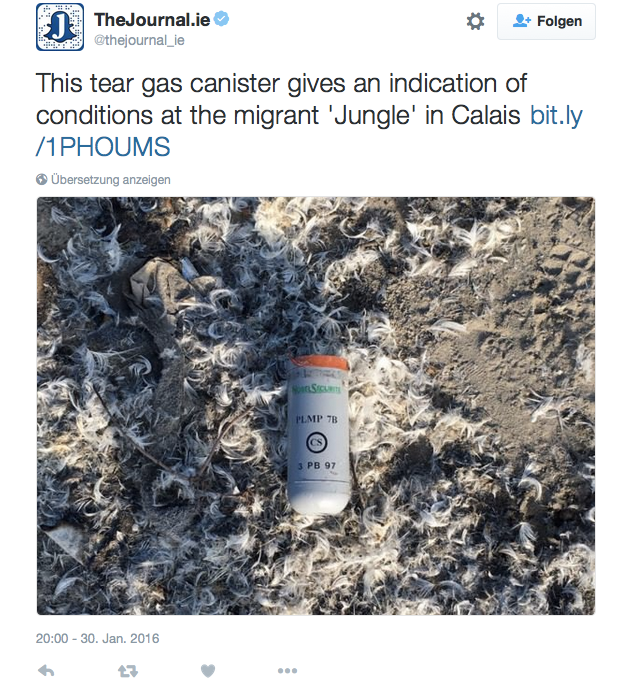 It has played a number of roles in Calais to date. Three of the companies initially involved in building and owning the Eurotunnel are now part of Vinci. According to its website, Jackson’s seems to be a small to medium-sized ‘family business’ involved in the design, manufacture and installation of timber and steel fencing, gates, environmental noise barriers, bollards, automation and access control systems. One news article claimed that the company has representatives in Russia and the Gulf states, although no contracts in these places are publicized on their website.23 Most of the other contracts seem to be smaller jobs like building fences around schools or company buildings. According to Cette Semaine, Groupe CW was responsible for fencing at the Container Camp site opened in 2015. Address: Launay des Moulins, 35390 Grand-Fougeray (Ille-et-Vilaine), France. The equipment is supplied by the UK division of L3 Communications, which is a massive corporation created in the US.34 L3 was previously among the top 10 US Government contractors, though it had declined to 15th place by 2015, after receiving ‘only’ nearly $2 billion in contracts from the US Government that year.35 It has received contracts connected to the US-Mexico border and has profited heavily from the US invasions of both Iraq and Afghanistan, among other places. “This system is used solely for searching soft-sided vehicles. The PMMWI consists of a computer system housed in a vehicle and a reflector. The vehicle is mobile, however the reflector is stationary. 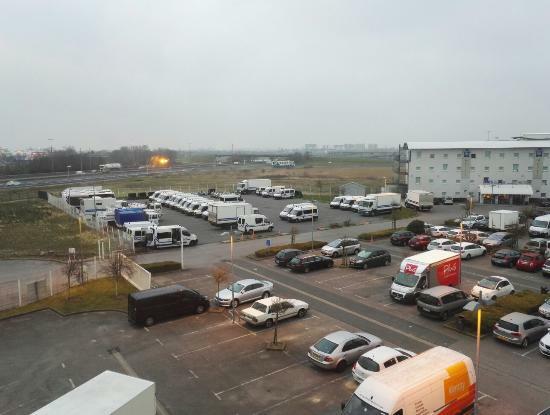 Due to the set up in Calais, the vehicles remain in the same place. At peak times, soft-sided vehicles are directed through the PMMWI. This piece of kit is beneficial because the vehicles do not need to stop, they can pass through at a speed of 5 KMH. This increases the number of vehicles that can be searched in a certain time frame, enabling a backlog of vehicles to be controlled quickly. 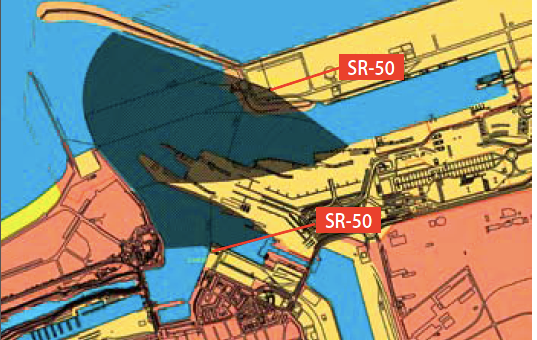 According to a contract published on the TED database, “Border Force search of vehicles operations at the juxtaposed ports in northern France currently includes the use of passive millimetre wave imaging (PMMWI) technology on moving soft sided freight vehicles to check for the presence of persons illegally stowed within trailers. A total of five (5) PMMWI systems are currently deployed; two (2) systems at Calais, two (2) system at Coquelles and one (1) system is also deployed to the port of Zeebrugge in Belgium.”38 The Home Office is currently seeking to upgrade the PMMWI systems now in use and, according to the notice, it organized an event with PMMWI manufacturers in April 2016 to discuss future expansions. Roke Manor Systems is part of the Chemring Group, a global defense company. In March 2014, Chemring Technology Solutions publicized another of their products, VehicleScan, as a potential solution for scanning the bottom of lorries.39 It’s unclear whether or not this proposal was taken up by the UK Home Office. The page mentions the Calais Port 2015 expansion, seeming to imply Thales’ continued involvement in the project, but doesn’t immediately make clear what sorts of expansions of the current ‘access control system’ are planned by Thales, if any. 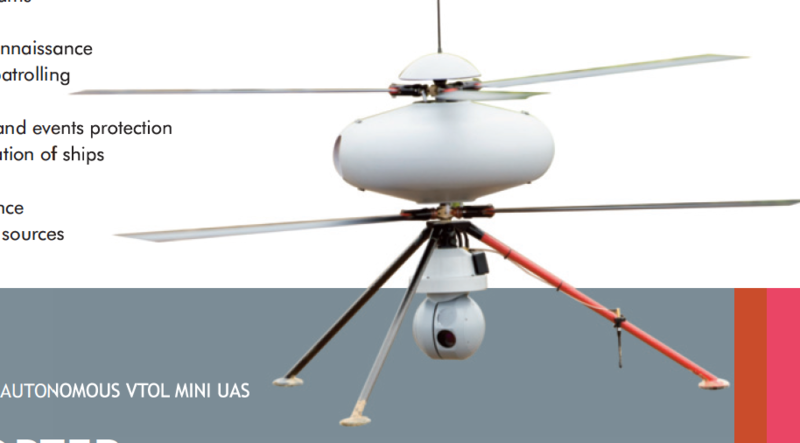 It has not been publicly announced who produced the two military drones that surveil the Eurotunnel site, however a visual comparison of Thales’ Spycopter and the Eurotunnel drones suggests they might be the same. Beyond Calais, Thales is also one of the top-earning companies in the border industry. worldwide related to homeland security and border surveillance”. Its business report in 2011 mentioned a strong growth in revenues from the ‘border protection business’. “Thales has deployed a complete, integrated system for border security at the Eastern Latvian border, combining command and control software with optronics, sensors and a communication network. In 2014 the dictatorial government of Turkmenistan issued a tender for a satellite-based monitoring system for its whole border with Afghanistan. Thales was one of the companies that responded, but it wasn’t disclosed which company won the contract. Thales works with Aerovisión, a Spanish company, on the international marketing of its Fulmar UAV, operated for border surveillance in the Malacca Straits, and on developing applications for it. 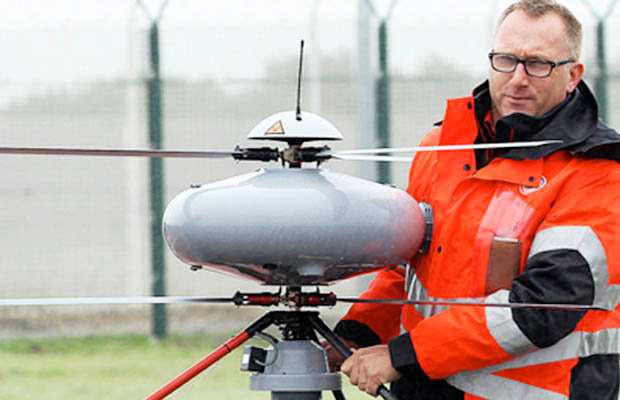 In January 2012 it gave a real flight demonstration of the Fulmar drone for Frontex. Thales’ radar is installed on many ships around the world, some of which are no doubt used for border patrols. Thales also produces electronic ID-management systems. In 2013, as a subcontractor for Oberthur Technologies (France), it supplied Uzbekistan with a border control system, consisting of “411 biometric data acquisition stations at locations throughout Uzbekistan and at its embassies around the world” and a centralised system that monitors passport applications and manages passport issuance. France purchased a “biometric enrolment and data transmission system”, while Morocco and Kenya are clients for Thales-produced identity cards. 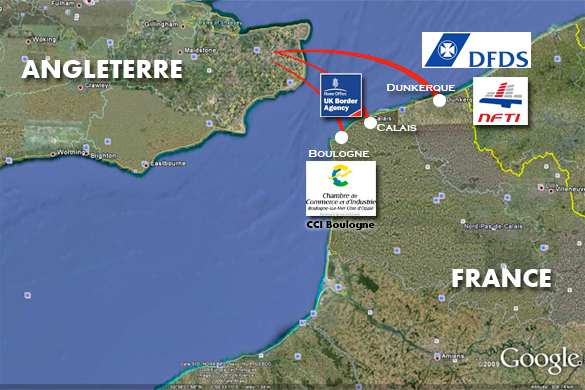 On its website, FLIR Systems reports that there are two SR-50 thermal imaging cameras in use in Calais (see map). They give “a clear image of the situation in the darkest of nights, in all weather conditions… they are mounted on a pole so that they can easily overlook an entire area… One of the specifications for the thermal imaging cameras during the demonstration was that they needed to be able to see the head and shoulders of a person floating in the water at a distance of just over 400 metres.”44 This statement seems to be quite old, from 2007, and it’s not clear whether this company has produced more equipment in use in Calais in the meantime. FLIR has increasingly produced thermal imaging systems used for drones and military operations like those in Iraq and Afghanistan. T-2000 FLIRs are mentioned repeatedly in Iraq Wikileaks documents.47 FLIR also seems to produce the cameras used in, among other things, Apache helicopters in Afghanistan. In a contract award notice published on the TED database, Smiths Detection is announced as having been awarded over €3 million for x-ray and CT scanner technology for use on the Eurotunnel site.48 Smiths Detection is a British multinational specializing in the design and manufacture of sensors to detect and identify explosives, weapons, chemical agents, biohazards, radioactive material, narcotics, etc. Rapiscan Systems is a US privately held company that specializes in walk-through metal detectors, and x-ray machines for airport luggage and cargo screening. 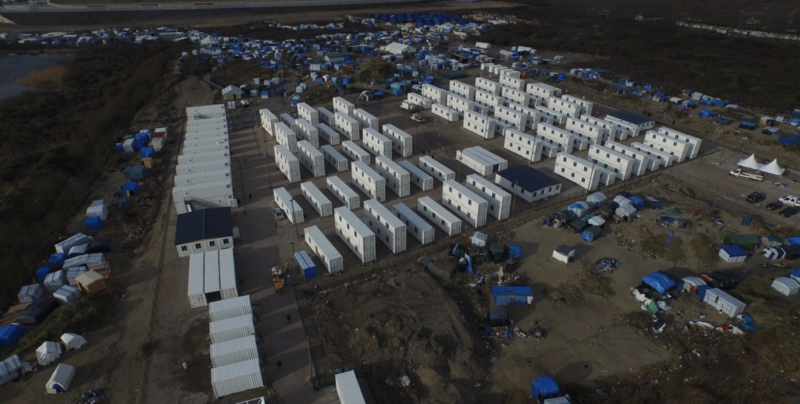 It is listed in the UK government’s contractsfinder database as one of the companies which provided the x-ray equipment used in Calais.53 OSI Systems is the parent company of Rapiscan Systems. In February 2016, Scan-X received a £500,000 contract to maintain existing x-ray scanning systems originally manufactured by L3 Communications and Rapiscan Systems for the UK Home Office.54 Scan-X produces a variety of x-ray scanning equipment used in airports and at borders, as well as heartbeat monitoring equipment (we are not aware of its equipment being used in Calais, however). 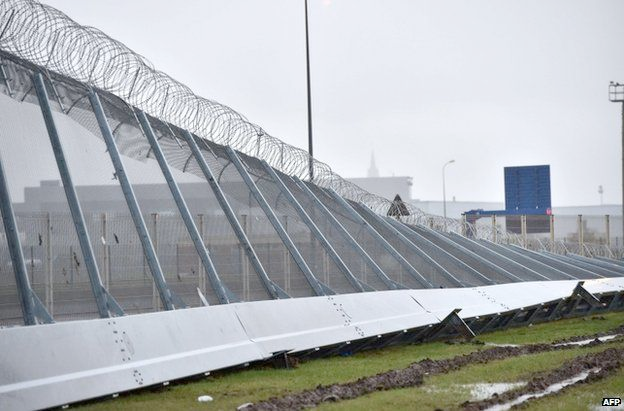 The black poles placed between the fences near the Calais port are in fact infrared barriers that form “a real immaterial wall of detection” (SOLARIS description) that sends signals to a control centre whenever someone is detected. Sorhea confirms the barriers have been used in Calais on its website. The company specializes in such detection systems and states on its site that its products have been used in military bases, detention centres, buildings classified as “defence secret”, industrial sites in the aerospace and armaments sector, banks, large oil facilities and ‘VIP residences’, among other places. Lorry drivers can be charged a £2,000 fine for each person found hiding in their vehicle. In 2014, there were £4.2 million fines on hauliers.60 This law pits drivers and migrants against each other and reduces the possibilities for solidarity from lorry drivers. It has also effectively externalized part of the task of border security to lorry drivers, which has led to an increasing trend towards drivers using more advanced security technology in addition to just visually checking their vehicles for passengers. In October 2015. 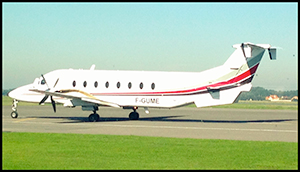 Streetpress reported that the private jet used by the Police Aux Frontières to internally deport migrants from the Coquelles detention center throughout France was a Beech 1900, produced by US aircraft manufacturer Beechraft.64 Beechcraft was previously a division of the defense giant Raytheon but since 2014 has been part of Textron Aviation. The aircraft was reported to be owned by Twin Jet, a small French regional airline, which was renting it to the PAF to the tune of €1.5 million a year.65 The salaries of the PAF officers involved and the price of fuel used are not included in this figure. 10 PAF and 2 pilots were employed each week to carry out these operations. Streetpress estimated that the costs of these operations, which had no other point than to gradually wear down migrants through repeated internal expulsions, could have averaged around €23,000 per day, despite the fact that a maximum of 5 migrants were sent on each flight. This was due to the fact that the plane only had 19 seats and that 2 PAF officers were required to ‘accompany’ each migrant. When not used for making transfers to detention centers, the Beech 1900 was used for ‘extended border operations’, according to one PAF cop. AccorHotels owns not only the IBIS chain but also a variety of other hotel chains, including Hotel F1, Mercure, Novotel, and Sofitel, among others. This section contains general information on the companies manufacturing the weapons used by the CRS and Gendarmes throughout France. Since this is not specific to Calais and has been written about elsewhere it has covered less comprehensively here, but for further technical information you can take a look at a related document published on the le ZAD website mentioned here in the footnote.71 Many of these weapons have been observed in Calais but we would have to do additional research to confirm whether all of these are currently in use in Calais. 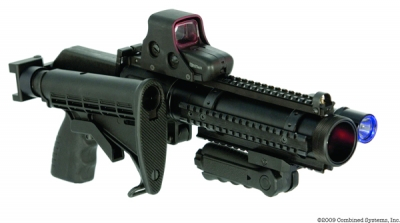 Combined Systems72 is the parent company of Penn Arms, which produces the “Penn Arms PGL-65” launcher used by the CRS.73 The gun is classified as “less lethal” and can fire 6 shots in 4 seconds. It is only authorized to charge the gun with teargas or smoke cartridges, but technically rubber bullets could also be loaded. While CRS had access to this gun since 2013, it was limited to the “special means sections” of each company. Since 2016 it has been expanded in use. GEIM is a French company specialized in providing products and service in the areas of ‘security’ and ‘defense’. Among other things, they produce LDIs, or ‘dissuasion and interception’ lasers, which they first unveiled in June 2016. The laser sends beams of light to temporarily overwhelm and confuse those at the receiving end. 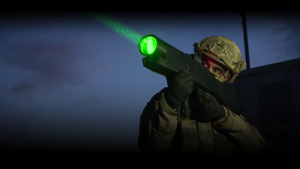 Similar lasers have been used against Somali pirates, though GEIM claims these lasers are in line with French safety standards (but: if the laser is used at close range, it’s not clear whether these safety standards would still be met). 4 Mentioned in the report above. 19 http://multinationales.org/Vinci-and-the-Khimki-forest-legal; many more links here: https://en.wikipedia.org/wiki/Khimki_Forest#The_role_of_the_French_multinational_Vinci_S.A. 37 This information comes from a document obtained by CMS activists several years ago, which was passed on.